At the marina yesterday, I found the No.1 battery (my engine starter) lowish, while the No.2 battery was almost fully charged. I have no idea why there should be a difference as they were both fully charged when I last looked a week ago. The engine started easily on the No.2 battery and the other one is now fully charged, but I shall keep a close eye on it. 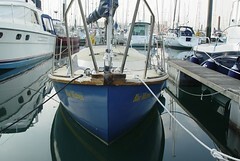 The current high winds have worked the warps hard and there were early signs of chafe on the aft spring. I changed this to a heavier rope as this takes the full weigh of the boat most often. Where Blue Mistress is moored, in the corner of the marina, most of the gales seem to deflect from the other side of the river and push her away from the finger. This is good because, as I’ve mentioned before, her deck is level with the pontoon/finger making it difficult to position the fenders. If they are raised to sit between the rubbing strake and the finger, they work themselves out. Placing them so that they are just below the rubbing strake keeps them in place and the hull off the finger in a calm, but with a swell there is a tendency to roll and the possibility of sliding under the edge of the finger. In the very heavy winds before Christmas, there was some slight damage. As we are in a corner with plenty of room, I have been able to overcome this by running a warp to the far pontoon from midships. Together with the starboard bow warp to the pontoon, this holds her about two feet off and still allows room for a large motor vessel to moor opposite.